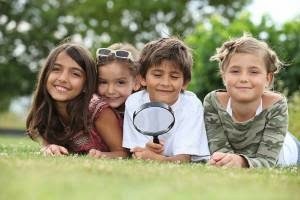 Worthington Lower: Think Like a Scientist: Classes, Camps and Parties! Think Like a Scientist: Classes, Camps and Parties! One of the problems that I run into as my children get older is how to keep them busy over the summer. I used to read the posts about how to keep the little ones busy over the summer and thought "what's so hard?" I get it now. I sooo get it. They LOVE school and really like getting out of the house, learning and playing with other children. It also gives them the opportunity to go to their own classrooms and be their own person individually rather than as the "Big Sister or "Little Brother." When we were kids, we played outside all day with our neighborhood friends. Sometimes we went swimming, sometimes we had a school friend over or went to the movies on a rainy day, but we weren't entertained by our parents and we didn't need to be. These days things are a bit different. The idea of letting my kids wander the neighborhood is terrifying, and it a good neighborhood! Traffic and not knowing our neighbors makes for a bad combo. There also aren't very many young families where we live. They get bored. And, I am not even the one dealing with it. The kids spend the weekdays with my Mother and Mother in Law and I feel bad that I am putting it on them to keep them busy. I don't like the idea of day care or full day summer camp (nor can we afford it - yikes!) so half day or week long summer camps and Bible Schools are good option for us. One of the camps that I am totally impressed with is Think Like a Scientist. This is a local organization created by two inspiring teachers that have run a program out of local schools and now have their very own location! Think Like a Scientist! llc began as a dream. We, (Coleen and Jodi) began teaching together at a local preschool in 2007. We taught the three year old program and a Pre-K Enrichment class. Our Enrichment class evolved into a Science Enrichment class. We wrote curriculum and developed a passion for teaching science to young children. Most importantly, we were excited by the fact that the children loved learning about science! Our science enrichment class inspired us to create Camp for a Cure, a science based camp, which funds both of us to walk in the Susan G. Komen 3 Day Walk. We have led Camp for a Cure for the past 6 years. We have walked in 6 different cities, while aiding in the fight against breast cancer. We will continue our tradition and look forward to hosting Camp for a Cure at Think Like a Scientist! llc. While having fun teaching young children, we continued to dream about beginning our own program and teaching children hands-on science through exploration of all content areas. A local private school was looking for a program for their young students. Think Like a Scientist! began because the school provided us both the space and the opportunity. We taught Think Like a Scientist! at their location for three years before we decided to take a leap of faith and open our own location! Now Camp for a Cure is running our of their very own location and two more weeks of themed camp will be added. One in July and one in August. Camp for a Cure still has a few spots open in June, but do not hesitate because they are going fast! To Register: Contact Coleen Herbst and Jodi Wooten at tlascientist@gmail.com or 484.678.1602. We will email you the necessary paper work to enroll your child. Full registration fee is required to hold a spot for your child on one of our camp rosters. These ladies are in high demand. Camps are filling up, their classes and parties (yes, science themed parties! I've been to one and it is the most organized, engaging and CALM children's party I have ever been to.) are expanding and preschools in the area are clambering to get them in their schools for the fall. If you are in the Chester County area, look them up!